America's Army 3 is a first-person shooter video game developed by the U.S. Army. The game was first announced in 2008 and was finally released as a free PC game in June 2009. America's Army 3 is the follow up to the original America's Army and America's Army 2: Special Forces, and was re-developed using the Unreal Engine 3 game engine. Since its release in 2009, the game has received a number of notable updates. In 2011, version 3.1 and 3.2 were released, both of which included a number of new features over the original AA 3.0 release. The latest release of America's Army 3 is now available through Steam, a digital game service with full multiplayer capability, Steam achievements, rankings, badges, medals, and more. Like the previous games, America's Army 3 puts players into the role of a U.S. Army soldier through taking part in both individual training and team-based operations and missions. With the previous AA games, players were required to complete certain missions and objectives which would unlock the multiplayer modes or grant access to different servers that enabled new maps and/or abilities. In America's Army 3, players can jump right into the multiplayer game modes; however, they will be limited in what they can do until equipment and skills have been unlocked. Missions include basic U.S. Army tasks such as learning how to utilize an individual first-aid kit as well as more advanced tactics in team-based operations. Players are also bound by standard U.S. Army Rules of Engagement and earn experience that will unlock equipment and maps or earn players badges and medals. The multiplayer mode of America's Army includes four different types of soldiers or roles. These roles include Rifleman, whose primary weapon is an M16A4 rifle; an Automatic Rifleman armed with an M249 SAW; a Grenadier, who is equipped with an M320 Grenade Launcher; and a Squad Designated Marksman, who is armed with a scoped M16A4 DMR rifle. There are 15 multiplayer maps. 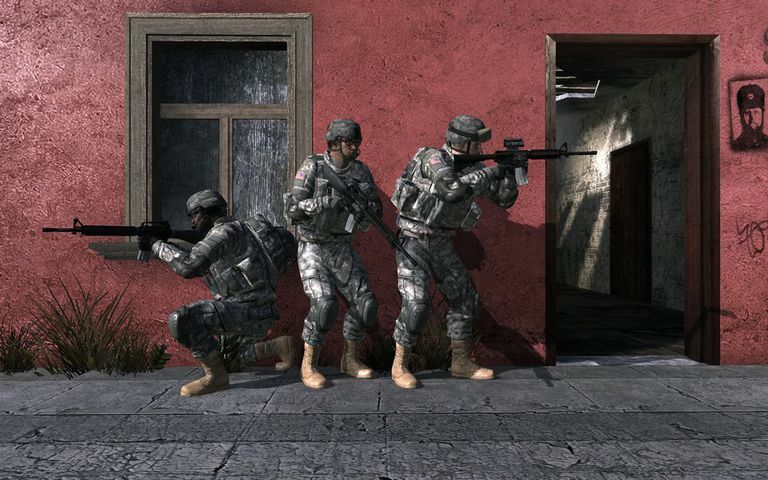 America's Army 3 also continues its emphasis on as much realism as possible — players are not able to continually bunny-hop across an environment, a common tactic in multiplayer shooters, in order to make themselves more difficult to shoot. Likewise, the game features authentic U.S. Army weaponry and equipment, all of which are rendered with state-of-the-art graphics. As noted above, America's Army 3 is a free PC game that can be downloaded through the Steam App. The America's Army series of free PC games have all been paid for by the U.S. Army, with the first being developed by an Army Colonel as a recruiting and instructional tool. Each subsequent release has provided more features and updated graphics while staying true to the initial purpose of the game. America's Army 2, which is also known as version 2.0 and America's Army: Special Forces was released in 2003, at a time when the army was looking to greatly expand the number of soldiers going into the Special Forces of the U.S. Army. This version of the game bore very detailed and accurate content detailing standard U.S. military training and tactics. The continued development of this version was handed off to Ubisoft, which created yet another version called Rise of a Soldier for the Xbox console. The most recent release of America's Army is titled America's Army: Proving Ground. It was released in 2015 on Steam and includes gameplay found in previous releases, as well as tactics and training currently used in the Army. Proving Grounds also includes a full mission editor, allowing gamers to create their own custom content.